Much like Goldilocks had her three bears, the 2012 NHL Entry Draft has its three “Bergs,” a trio of talented Swedish forwards expected to go in the first round. A lot has been written about Filip Forsberg and Sebastian Collberg, on some levels winger Pontus Åberg has gone under the radar. That’s a bit strange, because on some levels he’s more impressive than the other two Bergs. Last year he had a cup of coffee in Elitserien with Djurgårdens IF, earning a late-season promotion from their junior team. He followed up that with a full-season performance this year, putting up 15 points in 47 games with the club and finishing seventh in team scoring as an 18-year-old. Most importantly, Åberg’s 2011-12 season proved that he can hack it in a competitive men’s league. More importantly, playing in Sweden’s pro leagues will help him improve against better players. Djurgårdens was relegated to the secondary HockeyAllsvenskan following this season, while Åberg is under contract through the 2013-14 season. Luckily for his club, Åberg has a lot of tools that should only get better as they become more refined. A lightning-fast skater, he’s also blessed with very good vision, a strong shot and keen instincts. He’s more prone to shooting than passing, but he’s shown the ability to both since turning pro. 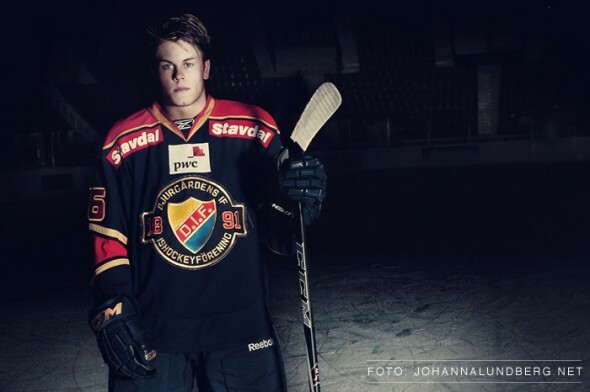 Pontus Åberg represents a very attractive package for a hockey club at the draft. He’s got a lot of tools at his disposal and he’s already shown the ability to compete with men at the professional level, albeit on a team that was relegated from their league following this season. While he’s unlikely to be leaping across the Atlantic Ocean to join an NHL organization in the next two years due to his contractual agreements with Djurgårdens IF, Åberg will be spending his team battling in one of Sweden’s professional leagues and should be well along his development path by the time he makes the trek to North America. Åberg had comparable statistical performances in Sweden’s professional ranks this season to Forsberg and Collberg, but it’s likely he’ll go later in the first round. Whichever team snags him will get a very talented player, even if they have to wait a couple of years to fully enjoy what he brings to the table. Åberg played eight games this year with Sweden’s Under-20 National Team, but missed the World Juniors due to an injury. He was previously a fixture on Sweden’s national teams as a teenager, including playing at the World Under-17 Challenge. Åberg can play both left and right wing.